We realize there has been a lot of changing information about this Saturday, June 10th, and an upcoming rally (now at Seattle City Hall plaza, 600 4th Ave.) by Act for America, which is recognized by Southern Poverty Law Center as a hate group, along with some counter-presences to support our Muslim neighbors. While faith leaders have been involved in conversations with an ad hoc group planning a counter-presence this Saturday, the Church Council of Greater Seattle, the Faith Action Network, and other faith organizations have decided not to sign on organizationally to a counter rally. 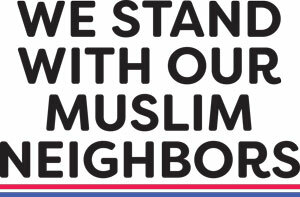 We Stand with Our Muslim Neighbors. Whatever happens on Saturday will have the greatest impact on their communities. Contact the media as people of faith, with op-eds and letters to the editor. These can be sent to: letters@seattletimes.com; letters@nytimes.com; orletters@washingtonpost.com to name a few. Please let us know if you are willing to do media interviews. Please see and share with your networks these wonderful faith leaders speaking on KING 5 Tuesday night. Please download signs (letter size or ledger size) to be displayed publicly in your faith communities/homes/cars/businesses, to show your support. We want to leaflet the city with this message, during our Muslim neighbors’ holy month of Ramadan. A sign delegation is planning to go out in downtown Seattle and ask businesses to post these signs on Friday 6/9, 10:30 AM-12:30 PM; please contact Rev. Mike Denton revdenton@gmail.com or FAN at 206-625-9790 if you’d like to be part of that effort. Meet at Plymouth Church on 6th and Seneca at 8:45 am to finalize the plan and walk to the site of the Act for America rally. Our purpose is to be a presence of peace and non-violence, observing what is happening, and perhaps documenting by social media. Leafletters will share an information sheet that describes the positive contributions of our American Muslim neighbors and what Sharia Law really is, and also counters the Islamophobia the rally is trying to spread. FAN Governing Board Co-Chair Rev. Carol Jensen will be the contact point for Leafletters: Contact fan@fanwa.org or 206-625-9790 before 5pm on Friday and they’ll put you in touch with Carol. Check out the Combating Islamophobia Action and Resource List shared with the Church Council from our local Muslim partners. Get to know your Muslim neighbors through interfaith Iftar dinners during Ramadan; see this list for the Puget Sound area. Continue reaching out to media in your community. Visible gatherings and education opportunities for faith leaders and faith communities about countering Islamophobia will be held after Ramadan. Stay tuned!